Matt Wadsworth is not (yet) a big player teaching IM however he runs a great niche online business. 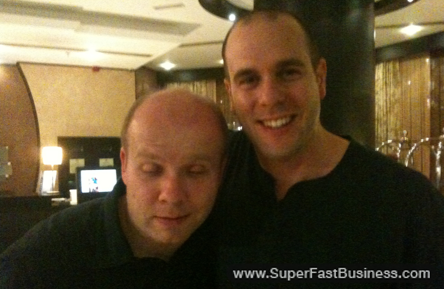 I met Matt in Dubai where we were both speaking to a new emerging market of Internet marketing students. Matts success in the niche markets depends on a specific strategy. He went looking into this business because he wanted more money than he earns as a classical musician. Going from a specialist to an internet marketing expert forced some great habits that others can learn from. Knowing why you want to be an internet marketer is more important than doing the processes themselves. A specific focus around mindset is essential before you get too far into the ‘tactics’. 5% of what you do will get 95% of the results. The internet is a business and knowing what your objectives are from the outset will help you be more effective, Matt suggests stepping away from the computer first to plan a little. You will also need persistence and perseverance to get success. Don’t expect things to happen automatically from the start. Once your business grows you can then automate and leverage. I asked Matt about his attitude towards money. We both found that by NOT focusing on just money we can get more of it. We both focus on delivering value to as many people as possible. Taking responsibility for your own financial well being rather than expecting others to provide you a magic carpet ride is the surest way to get ahead fast. Being able to generate your own income is a very empowering thing. When it comes to reasons why people cannot succeed Matt has got some perspective. Matt has been blind since birth. In this interview Matt explains how he makes money online without sight. One very important point Matt makes is how much better you can focus when you have less distractions. Knowing where to put attention is key in Internet Marketing. I say write down every excuse you have for not making money online and the ‘tear up your excuse list’. One of my many mentors Bruce Dyer taught me this years ago when I was a young sales person. How does a blind marketer do internet marketing? This is the easy bit according to Matt. A software program called ‘JAWS’ speaks out all the text on Matts screen. He is very adept at keyboard shortcuts too! The internet has made it easier for people who are in a similar situation to him. Accessibility on the web is improving for all of us it seems. Matt can do all of this without some of the software items we can use. We do not need to have the latest brightest objects all the time. The other thing that Matt has developed to a great level is outsourcing. He has a team of people who have become his ‘eyes’. I notice Matt asks others for their opinions on the way things ‘look’ so that he can triangulate an opinion on the object of his focus. We discussed decision making ability. What we have now is the result of decisions we have made in the past. Looking back to assess decisions is a good technique for refining your future decisions. Match your business to your skill set and make decisions based upon that. What has gone well for you in the past? How can you bring more of that into you future. Find what you are good at and do more of it. Teach it and transfer it to others. Generally when things are simple – not everyone is not doing it so it can cause you huge success. Matt gives the example of the website. Many people make it the big focus but the website is the last step. First you need to plan out the program. An important step is to identify a team to get around you, Find someone who is doing really well at what you need help with. Then you want to focus on traffic and conversions. The traffic must go to an offer and the conversions is turning the traffic into a customer. Matt like Joint Venture traffic. This is where you get others to promote and you pay them commission. You get paid to build a list. There are plenty of broke web designers around so focus more on the building of the system rather than the website. Matt likes creating his own product instead of selling other peoples products. Solving a problem is the key to selling more stuff since people pay for solutions. Do the things you are good at and get others to do the things you are not good at. When selling an affiliate offer create a bonus to give away. Find something that is already selling and create a complementary product. Offer it for free and you now build a list of clients from the market that you can now up-sell to. Buyers will jump at the chance to get a free bonus. The other product owners in the market will all approach you to sell their products and offer you special privileges. Looking around to see what is already selling is a great way to determine which products to create. Matt likes looking at the sales pages in the market and getting a feel for the bullet points. Check the magazine racks in the local store and if there is a magazine then you are in with a great chance. In public forums asking basic questions can often get you ‘flamed’. Success is all about failing fast, Falling down a few times is fine because it is likely to happen when you are starting anything new. Matt discusses why failing is a cultural thing we often fear. We discussed why a lot of out childhood programming and the school system is not really ideal for being an entrepreneur. We should question everything and be prepared to taking risks. Compared to buying a franchise we have very low risk online. Some marketers ‘try’ internet marketing for free. It can be very hard to make money online using free things. Once you get serious and have a few paid options your business can scale much faster. Examples, a professional auto responder will outperform a free server based email auto responder system. Paid hosting is FAR better than free hosting where they display free ads on your prime real estate. Failures are just an investment in experience. Buying training, coaching or mentoring can be an excellent decision when you feel you will be better off and you will get a return on your investment. When you buy resources you are better to consume them as quickly as possible. You will get better value if you can dive into some work in transit time or traveling. Reduce notes down to bullet points and implement as soon as you can. Key action items in order will help you get the high value from the timing of new information. Set your self a time limit of a few days. Matt agrees. If we can do it other people can do it. There are people out there doing very well so we should find it easy to be motivated by the fact that it can be done. Things can happen fast when you focus on the reasons why and the strong belief that it is doable. I recommend you focus on your business each month. A small fraction of the tasks you do will be making you the most money. A number of things you do will NOT be making you money. They need to go on your ‘to don’t’ list. Effort into things that you are good at does not automatically mean you will get rich. Never get too good at the little jobs. Don’t muck around with the little tasks too long if you feel you need to know how everything works. Once you know how to do the task it is time to outsource it. Leverage yourself by automating and systematizing as soon as possible. Realize what the value of the task is and score yourself accordingly. Expect to see Matt Wadsworth speaking at a very high profile yet ‘underground’ event in Washington D.C. Matt will be building his list in the Internet Marketing space now and he feels it is time since he has been proving himself in other niches first. Matt will be helping people with struggles and helping them out when they get stuck. Giving back is very important to Matt. Ask better questions. This will get you better results. Yanik Silver reminds me of this each time I have a brainstorm with him on a maverick tour. Matt adds to this. Ask better questions to better people. Find the best people and ask them. Find the best you can and get the highest level success answer! This is the fastest way to succeed. We both agree software is the great thing to sell if you have it. It is more complicated to get up and running but has a longer shelf life. To rate this podcast, visit our iTunes channel.